9 Explorers in red plastic: Janus Draik, Rogue Trader; Taddeus the Purifier, Ministorum Priest; Espern Locarno, Imperial Navigator; Pious Vorne, Missionary Zealot; UR-025, Imperial Robot; Dahyak Grekh, Kroot Tracker, Amallyn Shadowguide, Asuryani Ranger and the Ratling Twins, Rein and Raus. 35 Hostiles in grey plastic: Obsidius Mallex, Chaos Lord; 2 Chaos Space Marines; 4 Chaos Beastmen; 4 Ur-Ghuls; 4 Negavolt Cultists; 2 Rogue Psykers; 4 Spindle Drones and 14 Traitor Guardsmen. 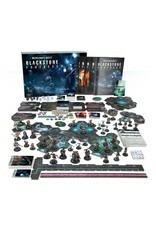 A 16-page Rules booklet: this walks the player through games of Blackstone Fortress from setup to exploration, with explanations of special rules and a quick reference guide. A 16-page Combat booklet: this contains all the rules for resolving combat during games, with easy to follow annotated examples and a quick reference guide. A 24-page Precipice booklet: this details the actions that occur between expeditions, with your explorers resting and rejuvenating. A 24-page Background booklet: this provides details on the Fortress, the explorers and the hostile forces they face. A 16-page booklet of datasheets for using the included miniatures in games of Warhammer 40,000. 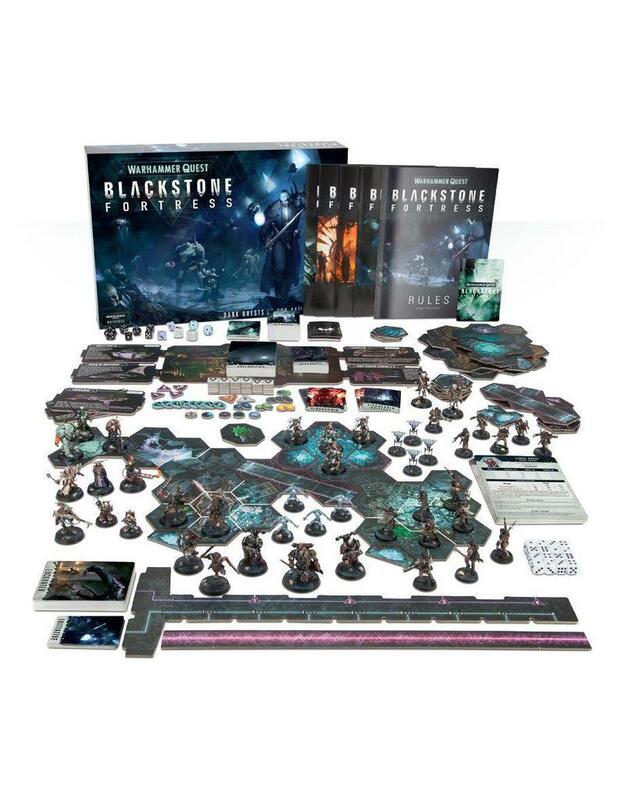 40 double-sided board tiles to create the internal labyrinths of the Blackstone Fortress. 9 Stasis Chambers – safe places for characters to rest between explorations. A Databank and a Hidden Vault.